Your company may never leave once you impress them with this decadent dish. Yields: 4 to 6 servings. Bring water to a boil in a large saucepan and add 2 teaspoons salt. Sift in cornmeal gradually, whisking constantly to prevent lumping. Bring to a low boil. Reduce heat and simmer for 10 to 15 minutes or until thick, whisking frequently. Add cream cheese, Cheddar cheese, and Parmesan cheese; season with pepper. Cook until cheeses melt, stirring to blend well. Remove from heat and keep warm. Melt butter in a sauté pan over medium-high heat. Add prosciutto and sauté until crisp. Reduce heat to medium and add shrimp. Cook until shrimp are pink on the bottom; turn. Add mushrooms and sun-dried tomatoes; season with salt and pepper. Stir in lemon juice and garlic. Cook until shrimp are cooked through, stirring constantly. Add wine and stir up brown bits from the pan. Cook for 1 minute longer. Stir in green onions. 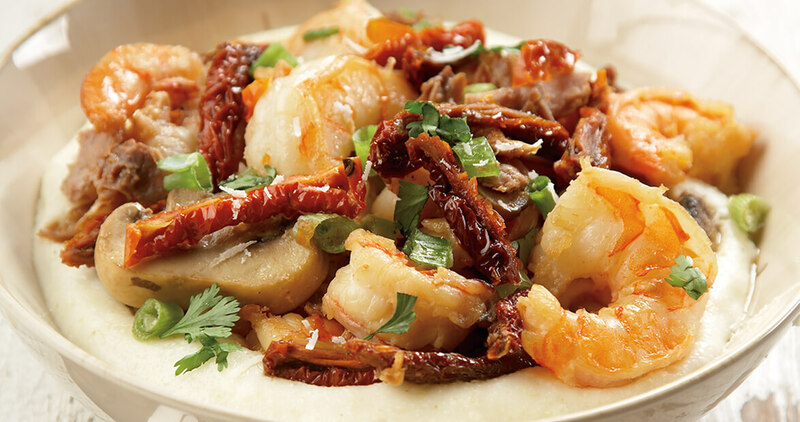 Spoon grits into a bowl and top with shrimp and cooking juices. Garnish with parsley and additional Parmesan cheese.